Today I was accused, twice, of bringing on this weather by wanting to train for the cold - unfair? Whatever... it has been good to try out my cold weather gear. Thanks to some very generous friends and family I am now in possession of wonderful undies to keep me warm, and which I suspect I shall live in as well as a down jacket. The ice has meant that the running has not been very safe, even the beach was solid this morning, but it didn't stop the girls. 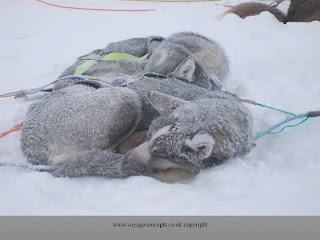 They have had to wear coats a couple of times on our walks and runs as they don't have the advantage of double fur, like huskies.